Resident orca are a genetically segregated ecotype of the killer whale species. There are two populations of resident orca in the Pacific Northwest, the Northern and Southern Residents. They live in large family groups called pods. Each pod consists of multiple related matrilines, each matriline made up of a female, her offspring, and subsequent offspring. Killer whales live in tight-knit families, similar to other highly intelligent and long-lived animals, such as elephants, wolves and humans. Off the Northeastern Pacific coast, we have two resident populations of orca, the Northern and the Southern Residents. Although the two populations do not associate with each other, the structure of their families is very much the same. Resident orca live in large family groups called pods, with multiple pods making up a population or community. The pods consist of multiple related matrilines, with each matriline often containing 3 or more generations. Each pod is led by the head female or matriarch, as orca are a female dominated species (just like humans, right guys?!) The matriarch tends to be the oldest female in the extended family. Her experience and knowledge guides the pod, and the matriarch teaches younger whales about everything from parenting skills, feeding tactics, and navigation through the vast territories that they cover. Orca have long life expectancies, 60 to 80 years for females and 40-60 years for the males. Females have the ability to reproduce as early as 14 years of age, but it is more common to see a female first calf at around 17 to 18 years old. Males reach sexual maturity between the ages of 17 and 20, but DNA research has revealed that older males are more successful with the ladies! A fascinating characteristic of orca is that they have the longest gestation period of any whale, averaging 16 to 18 months. This may seem surprising as killer whales are a relatively small whale compared to the big baleen whales, who have gestation periods lasting 11 to 12 months. Why then does such a small whale have such a long gestation period? Well the answer lies in the size of their brain. Orca have the second largest brain to have ever evolved in an animal on Earth (sperm whales have the largest). In order for the unborn orca to develop this large brain, they need more time in utero. Their large brain explains why orca are one of the most intelligent species in the world, with the ability to develop language, culture and sophisticated relationships. Another sign of how intelligent killer whales are shows in their mating behaviour. Orca do not mate within their own family, they prefer to find a mate from another pod. Even though all the whales in one population are distantly related, breeding between pods reduces the negative effects of genetic inbreeding. Contrary to many other whale species, orca do not have a breeding season, mating year round when the opportunity arises. Off the shores of Victoria, the Southern Residents are together much of the time from April until the end of October, so the majority of mating events do occur within this period. Females chose their mate and the males do not fight each other for female attention. A little persistence, a tall dorsal fin, and large pectoral fins go a long way! The true beauty of this species is demonstrated in the relationship between a mother and her calf. Once a calf is born into a resident pod, they remain in that pod for the rest of their lives, often side-by-side with their mom and siblings. Orca are the only known species in the world where both female and male offspring stay with their mothers and immediate family forever. Calves are always born tail first so that thy do not drown during the birthing process. After emerging from the womb, a close family member possibly an auntie, sister or brother, lifts the calf to the surface for its first breath, giving the mom a moment to rest. It takes a lot of energy to deliver a 2.5m, 200kg baby! The new calf begins to nurse immediately and continues to feed on its mother’s milk for up to a year. Calves as young as six months start to show interest in catching tasty salmon, ripping off pieces of fish that their mom offers to them. One thing that guests find most shocking about killer whale babies, is that the white parts of their body look peachy- orange in colour. The likely cause of this is that baby orca do not have a thick blubber layer when they are born, so for about the first six months of life, tiny blood vessels are showing through their skin, giving them a peachy complexion. It makes identifying a new calf very easy as a little black and orange torpedo shoots up beside a black and white female! 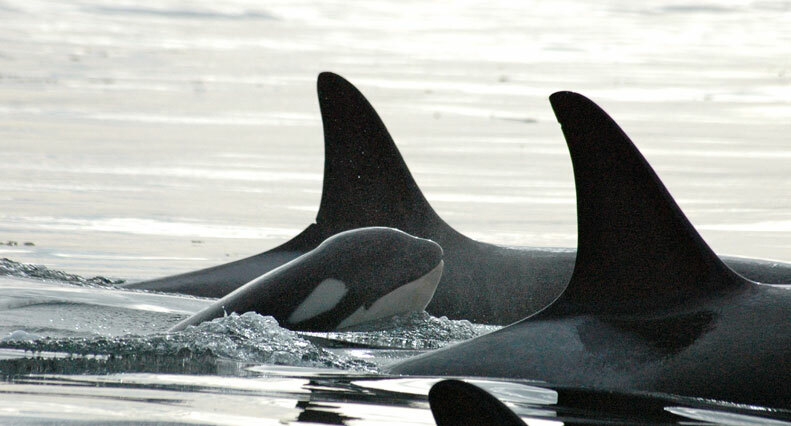 Female killer whales invest so much time in parenting, that they only have a calf every 4 to 8 years. This makes population growth slow, and recovery from the live capture trade during the 1960ʼs and 1970ʼs for aquariums difficult to overcome. Like humans, female orca go through menopause between their early to mid forties. After their child-bearing years are over, they play an essential role in the pod as secondary caregivers. Orca are very much a species where a community raises a child. All members of a pod help to take care of offspring whether they spend time playing with them, helping feed them, or teaching them valuable life skills. Now that you know the details of orca families, its story time! If you are not yet convinced that orca have amazing family bonds, this story will definitely change your mind. It exemplifies the ability for these marine mammals to experience feelings of empathy, love and loss while showing us that there is nothing stronger than the bond between a mother and her offspring. About ten years ago a researcher was out in his small boat observing one of the pods that belong to the Northern Residents off northern Vancouver Island. He soon noticed that a female had just given birth but the calf was stillborn. It is not uncommon for female orca to carry the body of their deceased offspring on their rostrum (what we would call their face), seemingly unable to accept the calf is gone. The researcher went out on his boat everyday and followed the pod. The mother continued to carry around her calf day after day, unable to eat or sleep. Orca need 200 to 300 pounds of food a day, so you can imagine how difficult it was for the mother to continue to carry her calf like this. Unable to hang on to the baby with hands, the mother and close family would dive down to retrieve the body of the calf every time it slipped from the mother’s face. On the eighth day of carrying her dead calf around, the pod came to a rocky shoreline at low tide. The pod formed a U-shape around the female and her calf. She slowly raised the calf’s little body on top of a rock ledge. The pod then all hovered in the water very still as if all saying their final good-byes, cooperatively mourning the loss of a family member they never got to know. To this day, it has been reported that this pod returns to the exact spot where the baby’s body was laid and they remain there for a length of time, everyone subdued. This is a true example of a mother’s love and a family’s uncompromising support through difficult experiences. Although this story is sad, it gives us an insight into the nature of these animals. It teaches us that humans are not the only species capable of deep emotions, and reminds us that we need to respect and protect the animals who we share this world with. We still have so much more to learn! The largest matriline in the Southern Resident population includes 5 generations. Resident orca are the only known group of animals in the world where both female and male offspring remain with their mothers for life. Fathers are from a different pod, thus there is no direct parental care by them. Males do help raise offspring in their own pod however, as ensuring the survival of relatives also acts to pass on their own genetics. Resident orca have a diet of fish and occasionally squid. Resident orca prefer to eat chinook salmon, making up 76% of their annual diet. Chinook salmon are the largest species of Pacific salmon, thus making them the most nutritious fish for the resident orca to hunt. Population declines in chinook salmon coincide with sudden declines in both resident populations, making chinook salmon stocks a major concern in the conservation of resident orca. Many species of salmon move from the open ocean, up the Strait of Juan de Fuca, and enter freshwater rivers like the Fraser River to spawn and then die. 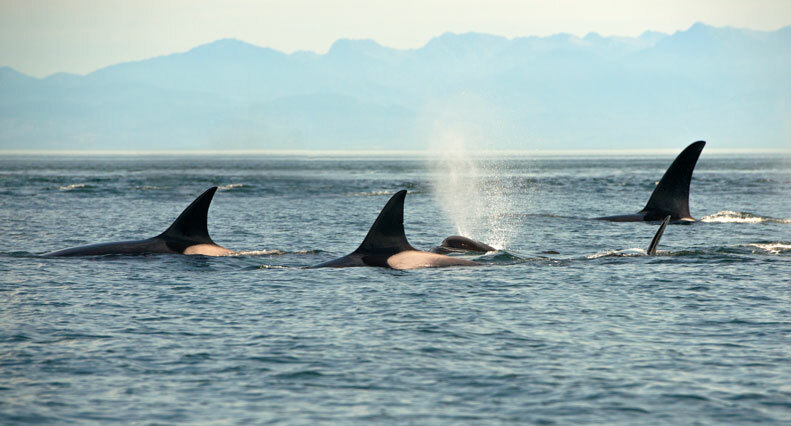 The Southern Resident Orca population follows these runs, making the waters off Victoria and the San Juan Islands a prime location for observing resident orca in the world. Resident orca are highly vocal whales. Each population possesses its own language that is not understood by any other population of orca worldwide, further segregating the communities. Resident orca are also highly playful, often seen breaching, spyhopping, tail lobbing, pectoral and tail fin slapping, rolling, submarining, and playing with bull kelp. Playful behavior acts to entertain the whales, forge deeper social bonds, maintain hunting skills and provide exercise for the animals. Resident orca maintain a genetic pool that allows for either closed or open saddlepatches. 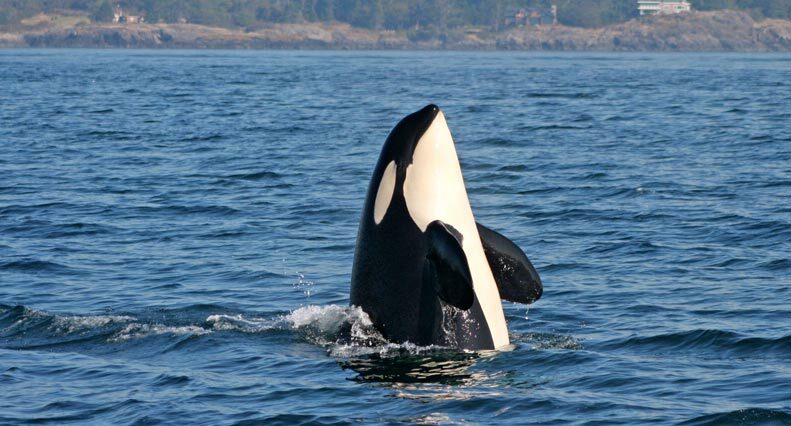 All orca have a saddlepatch, which is a grey to white area behind their dorsal fin on their back. Closed saddlepatches are solid in colour, whereas open saddlepatches have an area of black in them, ranging from a finger-like shape to a large triangular area. 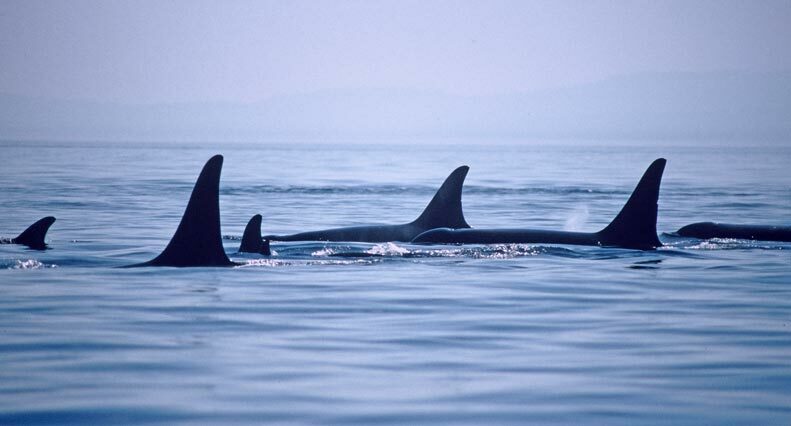 The dorsal fin of male resident orca are tall and triangular with a rounded tip. The female dorsal fin is shorter and softly curves back, also with a rounded tip. Each saddlepatch and dorsal fin is unique, both of which are used to identify each individual. Resident orca do not mate or socialize with different ecotypes of orca or even with other resident populations. Even though orca are the top predators in the ocean, they have never posed a threat to humans, in fact there are many accounts of orca helping or rescuing humans in distress. The lighthouse got its name from the extremely fast tidal movement past the rocky islets, which can reach 8 nautical miles an hour! Prior to the building of the lighthouse, several ships ran aground at Race Rocks and many lives were lost over the years. The lighthouse itself was constructed from granite blocks cut in Scotland and shipped over as ballast in a boat hauling timber. It is the only lighthouse on the Canadian Pacific that is constructed of stone. The contrasting black and white stripes were painted on the 24.4m tower by its first keeper, George Davies, because the lighthouse was said to be hard to see during the day when ships were traveling in from the west. At night the lighthouse lantern flashes once every 10 seconds, and in foggy conditions the foghorn blasts 3 times at one minute intervals. Today Race Rocks is an Ecological Reserve and Marine Protected Area. It is home to a unique marine environment with a vast array of species of fish, marine invertebrates, birds, marine mammals and seaweeds. Throughout the whale watching season, it is common to find dozens of Stellarʼs Sea Lions, California Sea Lions and Harbour Seals either basking on the rocks or hunting for fish in the food rich waters. Occasionally we even see massive Elephant Seals using the small islands as a place to molt. Race Rocks tends to be a favourite spot for transient or mammal-hunting orca to scope out for unsuspecting seals or sea lions. When whale watching in Victoria, the population of whales we see the most throughout the season is the Southern Resident Killer Whale community. The Southern Residents are the smaller of the two populations of resident orca that occupy the shores of British Columbia. During spring, summer and fall, the Southern Residents are most often found in the waters of the Strait of Juan de Fuca, Puget Sound, the Strait of Georgia and Haro Strait. However, they have been seen as far south as central California and as far north as the Queen Charlotte Islands. Their favourite location tends to be off the western side of San Juan Island, WA. The orca come to these areas because they are following the runs of salmon who are heading to freshwater rivers to spawn. Although resident orca do eat a variety of salmon species, chinook salmon represent 78% of their diet! Because of this populations predictable movements from April to November, they are the most highly studied orca population in the world. Most of the information that we know about orca comes from studies of this population. The Southern Resident community is made up of 89 whales, divided into 3 pods named J, K, and L. Because all the pods have related dialects, they fall into one clan, known as J Clan. J-pod has 28 members, K-pod has 20 members, and L-pod has 40 members. A pod consists of several matrilines that are related. The eldest female of a matriline guides the family, as killer whales are a female dominated species. A matriline will contain a female, all of her male and female offspring, and all of their progeny. The largest matriline in the Southern Resident community spans 5 generations! Talk about a big family reunion! The newest addition to the Southern Residents came as an early Christmas gift on December 17th, 2011. This new baby is known as J-48, as he or she is the 48th whale to be identified in J-pod. Orca calves have a 50% chance of surviving the first 6 months of life, so everyone is keeping a watchful eye on this precious baby. J-48 has a great chance of survival, as her seasoned mother, J-16 or more commonly known as Slick, has had 4 previous children who all survived infancy. The reason for the high mortality rate in orca calves is contaminated breast milk. Resident orca live in a highly polluted environment, the most harmful chemicals being PCBʼs, DDT, PCBDEʼs, mercury, and other heavy metals. These toxins suppress the immune system, cause cancers, birth defects, and reproductive problems. The orca accumulate these toxins from their food and store them in fat tissue. As breast milk is 35%-50% fat, mothers pass the toxins to their offspring. The first whale to ever be identified among the Southern Residents was Ruffles or J-1. Ruffles was the icon of the Southern Residents for 3 decades due to his 6-foot dorsal fin that had a prominent wavy appearance on its trailing edge. He is known as the most photographed wild orca in the world! Sadly Ruffles died at the end of 2010, as he did not return with J-pod last summer. The good story is that Ruffles was the oldest known resident male orca, reaching the ripe age of 59. Not only did he amaze everyone who laid eyes on him, he left many children behind who will hopefully possess his unique looks and personality! Recent DNA studies show that this handsome stud fathered many of the whales in the population today. Closest to Ruffles was Granny or J-2. Granny and Ruffles were somehow closely related, though we will never be sure of the actual connection. Granny is an impressive lady, as she is the oldest known orca in the entire world! She has shown no signs of slowing down as she approaches her 101st birthday this coming summer! I know what you are thinking….WOW, that is amazing! Granny is amazing and very well respected. She is the matriarch leader of J-pod, always leading the group and making decisions about when and where to travel to get to the best food source, how fast to go, and when to rest or socialize. She is very easy to recognize with her solid saddlepatch and half- moon shaped nick out of the trailing edge of her dorsal fin. Other iconic whales belonging to the Southern Residents include J-8 or Spieden, who makes a funny wheezing sound when she surfaces and exhales. She is also one of the oldest whales in the community, estimated to have been born in 1933! Cappuccino (K-21) and his sister Raggedy (K-40) are a famous pair in K-pod. Rarely do you see one without the other close by. Raggedy is the oldest offspring in their family, born in 1963, and Cappuccino is the youngest sibling in the family born in 1986. They are the only surviving members of their matriline, so they are very close to eachother. Raggedy can be picked out of a cluster of whales in a heart beat because the back edge of her dorsal fin is ragged looking (thus the name Raggedy) with many nicks in it. Cappuccino is the most iconic male orca in K-pod, with his very recognizable open saddlepatch. The easiest member of L-pod to spot has to be L-41 or Mega. Mega is now the oldest and largest male in the entire Southern Resident community. He has an enormous dorsal fin and a distinguishing nick near the top of his dorsal fin. Mega is always accompanied by his family, the L-12 matriline. His grandmother is the famous Alexis (L12), he has two sisters Matia (L-77), and Calypso (L-94), and his young niece Cousteau, born in 2009. All of the whales in the Southern Resident community have unique personalities and it is an amazing experience to get to know them all! A majority of all of the information about the Southern Resident orca population has been collected by the Centre for Whale Research, located on San Juan Island, WA. You know you came to the right place to watch orcas when the orca research station sets up shop next door! Ken Balcomb III started the research station in 1971, and continues to be the director and head biologist at the station. The Centre for Whale Research keeps a photo identification catalogue and history of all the whales in this population, conducting annual population surveys and other valuable studies. Another related place you must put on your visit list is the Whale Museum, also located on San Juan Island. Both organizations work together to collect data on the whales, educate the public, and fund research and conservation efforts to protect the Southern Resident population. In 2005, both the U.S. Fish and Wildlife Service and COSEWIC (Committee On the Status of Endangered Wildlife in Canada), listed the Southern Residents as Endangered. During the 1960ʼs and 1970ʼs, the majority of killer whales taken from the wild to put on display in aquariums unfortunately came from the Southern Resident community. A total of 68 family members were removed, leaving only 71 whales left by 1973. Today the Southern Residents face threats from food shortages, pollution, boat traffic noise and negative effects of inbreeding depression. Much effort is being made by both US and Canadian governments, non-governmental groups, and the general public to protect the Southern Residents and the habitat they live in. Ask your naturalists how you can get involved in conservation efforts to protect this amazing community of orca! The Northern Resident Killer Whale population is the larger of the two resident populations that live off the north Pacific coast of North America. Resident orcas are characterized by having strictly fish diets, large family groups, a complex social structure, and unique vocalizations. It is believed that the Northern Resident community has existed for the past 10,000 to 12,000 years. This period of time has given them ample opportunity to evolve a unique culture and language. The Northern Residents have a territory that extends the northern half of Vancouver Island up to southeast Alaska. They are most commonly seen during the summer months on the Northeast side of Vancouver Island, through Johnstone Strait, Blackfish Sound and Queen Charlotte Strait. These animals have a picky diet, they prefer to eat chinook or king salmon over any other species. Despite chinook being known for excellent taste, the whales most likely favour them due to their large body size and high fat content, rather than to satisfy a particular palate. The salmon migrate to inland waters, spawning in many freshwater rivers and streams, bringing the whales with them. The social structure of the Northern Residents is a bit more complex than that of the Southern Residents. The Northern Resident population consists of approximately 200 whales divided into 3 clans named A, G and R. The A,G, and R clans are divided by 16 pods. A pod is a group of closely related matrilines, as killer whales are a female dominated society. A matriline is headed by the eldest female of the family along with her offspring, both male and female, and successively, their offspring. There are 33 matrilines in total among the Northern Residents. The easiest way to understand this division of groups is by looking at their language. Each pod has a unique dialect of their language, similar to how an Australian, Canadian and British person all speak English, but all sound slightly different. Pods with related dialects belong to a clan, thus there are 3 unique languages among the Northern Residents. Even language in the animal kingdom gets complicated! The most famous Northern Resident whale has to be A-1, more affectionately known as Stubbs. Stubbs was the first whale identified in the population, thus she was given the alphanumeric name A-1. She earned her common name, Stubbs, because she had a severely damaged dorsal fin, which looked like it had been lobbed off near the base. The most likely reason for this deformity is from contact with a boat propellar, though this cannot be proven. Unfortunately orca have not always been admired by humans, many were shot at or ʻrunoverʻ by angry fisherman or fearful boaters. Luckily attitudes towards these gentle giants have changed, and they have become a symbol of Canadaʼs natural marine environment. As of 2008, the Northern Resident Killer Whale population was listed as Threatened under COSEWIC (Committee On the Status of Endangered Wildlife in Canada), providing protection for the whales, their environment and food sources.